Decapodian Warships are used by the Decapodian Army. The Decapodian Warship resembles a giant metallic hybrid of a horseshoe crab and a lobster. Its claws can be used to attack though it is unknown if they have any projectile weaponry. 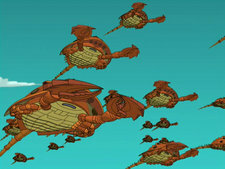 When the DOOP Army sieged the Decapodian Embassy to get Zoidberg after he ate the Earth Flag, Ambassador Mervin summoned a fleet of warships to attack Earth, beginning the Decapodian Invasion of Earth. The Nimbus confronted the fleet but the codes for the global defence network were stolen by the Decapodians, since Zapp stupidly chose to hand the key over to a obvious Decapodian spy, nullifying all of Earth's defences. The Nimbus was cut in half by the claws of a warship, and with their weapons useless the human race had to surrender, and was subsequently enslaved. After the crew of Planet Express decided to fight back, Fry came up with an idea to steal an ancient heat seeking missile and attack the Decapodians. The Decapodians revealed the Mobile Oppression Palace, constructed by the slaves and used to maintain their control on Earth, with this the warships were no longer needed to oppress Earth and were dismissed. The Mobile Oppression Place began to destroy the city. Fry deployed the missile but it missed the MOP as all Decapodian technology is cold blooded. After Zoidberg's lawyer was killed, Zoidberg set fire to the Earth Flag and threw it at the MOP, causing the missile to sense, hit and destroy it. Because the Decapodians had been relying solely on the MOP to control Earth, they surrendered, and the Earth was liberated, with Zoidberg honoured as a hero. This page was last edited on 12 November 2015, at 21:02.